While investigating a toxic outbreak in the Caribbean Sea that may ultimately threaten the United States, Pitt unwittingly becomes involved in something even more dangerous-a post-Castro power struggle for the control of Cuba. Meanwhile, Pitt’s children, marine engineer Dirk and oceanographer Summer, are on an investigation of their own, chasing an Aztec stone that may reveal the whereabouts of a vast historical Aztec treasure. The problem is, that stone was believed to have been destroyed on the battleship Maine in Havana Harbor in 1898, which brings them both to Cuba as well-and squarely into harm’s way. The three of them have been in desperate situations before . . . but perhaps never quite as dire as the one facing them now. Clive Cussler is the author of over twenty-five internationally bestselling books, including the Dirk Pitt adventure series, the NUMA FILES novels and the Oregon Files Adventures. He grew up in Alhambra, California. He later attended Pasadena City College for two years, but then enlisted in the Air Force during the Korean War where he served as an aircraft mechanic and flight engineer in the Military Air Transport Service. Upon his discharge, he became a copywriter and later creative director for two leading ad agencies. At that time, he wrote and produced radio and television commercials that won numerous international awards, one at the prestigious Cannes Film Festival. Cussler began writing in 1965 and published his first novel featuring Dirk Pitt in 1973. His first non-fiction work, The Sea Hunters, was released in 1996. Because of this work the Board of Governors of the Maritime College, State University of New York considered The Sea Hunters in lieu of a Ph.D. thesis and awarded Cussler a Doctor of Letters degree in May of 1997. It was the first time since the College was founded in 1874 that such a degree was bestowed. 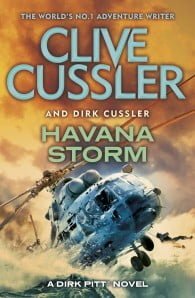 Cussler is the founder the National Underwater & Marine Agency, (NUMA), a non-profit organisation that dedicates itself to American maritime and naval history. In addition to being Chairman of NUMA, Cussler is a fellow in both the Explorers Club of New York and the Royal Geographic Society in London. A noted collector of classic automobiles, Cussler owns 85 of the finest examples of custom coachwork and 50's convertibles to be found anywhere. They are garaged near Golden, Colorado. Today, Cussler divides his time between the mountains of Colorado and the deserts of Arizona.